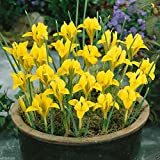 Iris danfordiae growing geophyte of the genus Iris and also known as Dwarf iris, Iris danfordiae perennial plant summer deciduous and used as ornamental plant, grow temperate or subtropical climate and growing in hardiness zone 4-9. Leaves color green in narrow shape grow straight and can be break easily, leaves grow in groups linked together. Flower color yellow, the flower has 6 petals: in the outer circle 3 with different inner yellow mostly darker yellow there is dots or little stripes. 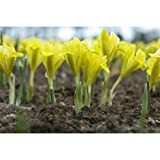 Dwarf Iris danfordiae Bulbs,Bloom Spring, Perennial,Fall Bulb, Now shipping ! Yellow flowers with 6 petals: in the outer circle 3 with different inner yellow mostly darker yellow there are dots or little stripes. Grow from seeds. How to make Vegetative Reproduction in Iris danfordiae? How much time does it take to grow roots in vegetative reproduction? What is the treatment for vegetative reproduction in Iris danfordiae?